Who’s not there: The credits simply say, “Based on the Television Series The Man From U.N.C.L.E.” No mention of developer Sam Rolfe, nor of Norman Felton and Ian Fleming, who came up with the character Napoleon Solo. Who gets the “p.g.a.” mark: Since mid-2013, most movies include “p.g.a.” after those considered the primary producers of the film by the Producers Guild of America. Steve Clark-Hall, listed second among the four, doesn’t get the mark. David Dobkin gets an executive producer credit. In television, executive producer is supposed to be the big boss. That’s not true for movies. Regardless, Dobkin’s name was associated with the project, circa 2010. Writing credit: “Story by Jeff Kleeman & David Campbell Wilson and Lionel Wigram & Guy Ritchie, Screenplay by Lionel Wigram & Guy Ritchie.” This was included in the teaser trailer but it goes by very quickly. Others jobs that get credits: Composer, costume designer, editor, production designer and director of photography. Other tidbits: According to this, the soundtrack will be available on Watertower Music. 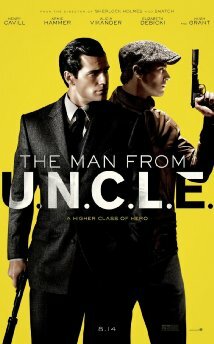 A Los Angeles Times blog says momentum may be gaining for a movie based on The Man From U.N.C.L.E. Now, “U.N.C.L.E.” is picking up more speed — of a sort. Borenstein has turned in his script (which is said to be a commercial action thriller with some comedic touches, but not the other way around) and the studio likes it and wants to move forward, according to sources. But Dobkin, it turns out, will only produce, not direct, which has led the studio to intensify its search for a director. Zeitchik provides some additional details and you can read the entire blog post by CLICKING RIGHT HERE. Now we’re on record as being skeptical of a Man From U.N.C.L.E. movie becoming reality. But if the LAT is on to something, we may have to re-evaluate.